Heldon and Laich councillor John Cowe and Lossiemouth Community Council chairman Mike Mulholland at the School Brae junction. Traffic lights could be introduced at a notorious junction in Moray in attempt to improve safety at a busy school crossing. Concerns have been raised about the speed of motorists at the foot of School Brae in Lossiemouth for many years. The junction with Elgin Road is regularly used by youngsters making their way to the town’s high school as well as Hythehill and St Gerardine’s primary schools. 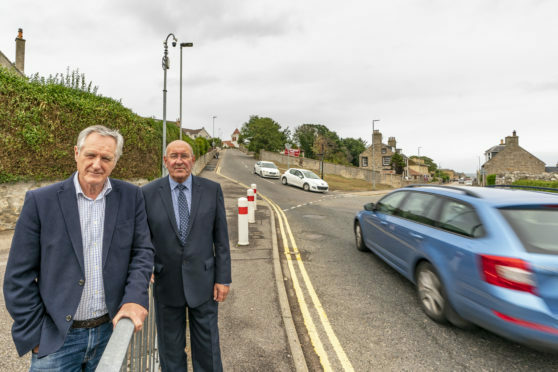 Now Moray Council is considering a £120,000 plan to introduce three separate pedestrian crossings and traffic lights in an attempt to make their journey safer. Fears about the speed and volume of traffic in the mornings have prompted school crossing patrollers at the site to speak out in the past. It is understood that at least one previous post holder has quit manning the corner as they themselves felt unsafe. Yesterday, Heldon and Laich councillor John Cowe explained that doing nothing at the junction was not an option. He said: “There’s a lot of concern about the junction – particularly around drivers putting the foot down as they approach School Brae to get up the hill. “There have been some narrow scrapes with accidents there in the past too. The last thing we want is children getting hurt on the way to school. Lossiemouth Community Council has spearheaded the drive for improvements after approaching charity Living Streets, which promotes walking to school. Chairman Mike Mulholland said: “When lollipop men an women are coming to you saying that even they don’t feel safe stepping onto the road then you know something must be wrong. “Improvements there would be not before time. Moray Council’s economic development and infrastructure committee is meeting today to debate the proposals. If approved, they will be funded entirely by a grant from the charity Sustrans and through a bid to Transport Scotland. As part of the plan, Ramsay Lane would be converted into a one-way street to prevent motorists accessing Clifton Road from it. The school crossing patroller currently at the location would be reallocated to a vacant site as a result of the introduction of the crossing.